I went in to my local horti store and they had mycelleum co2 exchange bags. Has any body ever tried using theses mycelleum exchange bags. I would really appreciate some feedback on results found with this method. Hello i would like to ask you wat happens with that co2 how it mix in the air with the intra & extraction of air en ventilation ? Do you need a special set up? So I've never tried this method before. The theory is the mycelleum takes in oxygen, that's present in the Garden, through the hepa filter( the white pad at the top quarter of the bag in the image). Then Co2 I released through the hepa filter , in to the garden, for the ladies to use in the garden . I reckon it's easy enough to do yourself. The only special thing I can see needed is the bag and hepa filter. I'm not sure where u live but if you live in the 1st world it should be difficult. I stay in Africa so it ain't so easy to source such raw materials. The mushie spores are easy enough, l9ads of people are growing edible mushies . 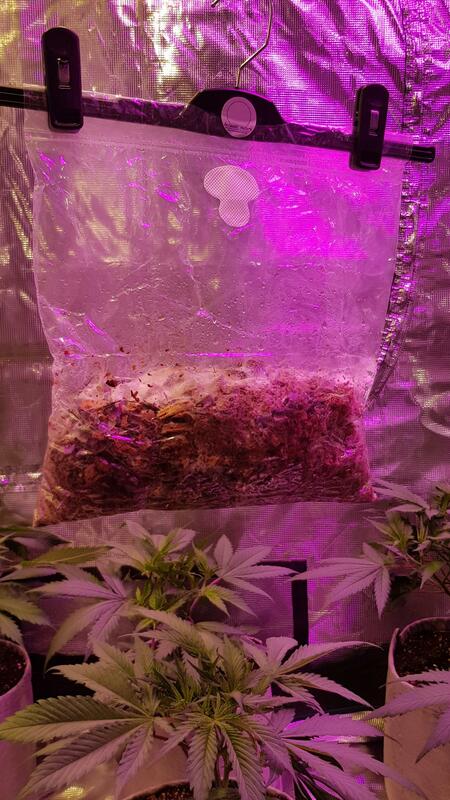 I think oysters are the spores in my bag but will double check..
A mate grows mushies and we want to experiment growing edible mushrooms is a split sealed garden next to a Dutch garden and extract the c02 straight in and see results..
Yeah it's a test and not sure if it's going to make a difference. But it can't harm it so that is most important!